The Employee Agreement is a terms and conditions form used to spell out the details of employment. 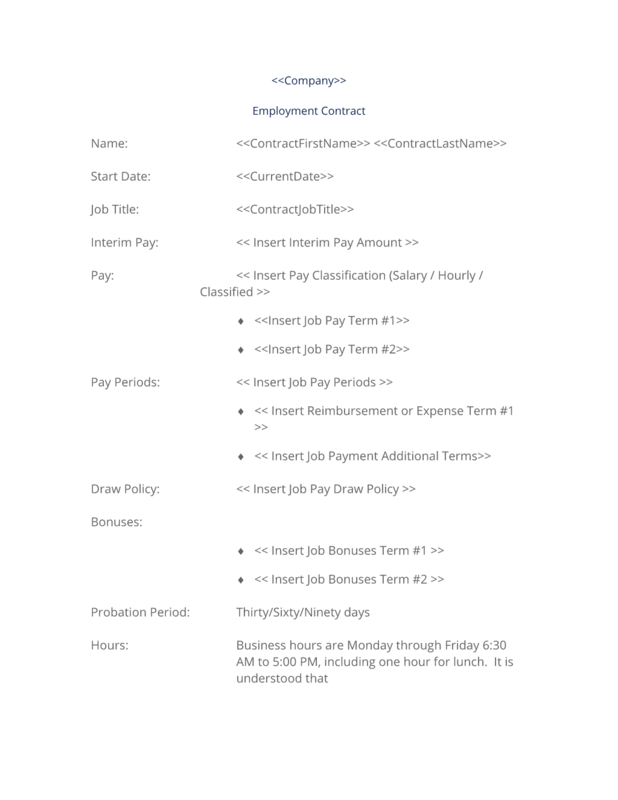 This Employment Short Form Contract is included in editable Word format that can be customized in Word or by using the included Wizard software. Interim Pay: Insert Interim Pay Amount. Pay: Insert Pay Classification (Salary / Hourly / Classified. Pay Periods: Insert Job Pay Periods. Reimbursement or Expense Term #1. Job Payment Additional Terms. Draw Policy: Insert Job Pay Draw Policy. Hours: Business hours are Monday through Friday 6:30 AM to 5:00 PM, including one hour for lunch. It is understood that employee's hours per day or week will be flexible. Employee is not required to be at the office during this time except for mandatory meetings or other prearranged events. Holidays: There will be Insert Number of Paid Holidays holidays per year as follows: Listed Paid Holiday Days. Benefits: Insert Description of Job Benefits. Personal Time: Insert Personal Time Policy Here. Mileage: Mileage reimbursement will be made for mileage directly associated with visiting customers and potential customers at the rate of Insert Job Driving Mileage Rate per mile. Proof of mileage must be maintained showing date, mileage, and the customer who was visited. I hereby accept the employment offer as outlined above. Signature of Person Accepting Offer Date Printed Name. Signature of Company Name Representative Date Printed Name. The complete Employment Short Form Contract - with the actual formatting and layout - is available in this Contract Pack.